Chiffon shirt by Max Mara; trousers by J. Crew; limited edition handbag by Fendi; antique diamond earrings from personal collection. Angarkha suit by Sabyasachi Mukherji; vintage clutch; vintage polkhi earrings; Swarovski studded chappals from Pakistan. Ruffled shirt by Gauri and Nainika; trousers by Armani; shoes by Christian Louboutin; black diamond ring by Neville Umrigar; satin and georgette vintage bag; real pearls from personal collection. 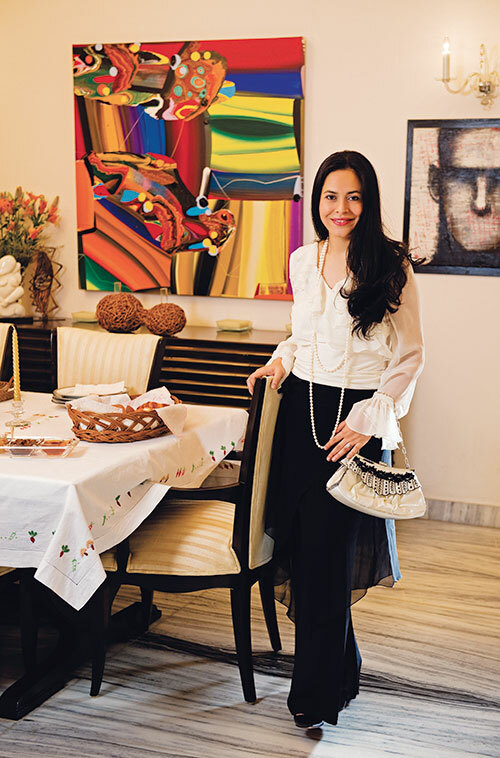 In a classic bungalow designed by German architect Heinz, in Delhi’s Jaipur Estate, once owned by that state’s royal family, surrounded by a not so fabulous garden, lives a woman of many parts. And, except that she bemoans the fact that she never sprouted a green thumb, she is a lady who has surrounded herself with beautiful paintings, artifacts and fashionable trappings. She could be deemed a fashionista who loves to dress simply, yet stylishly. 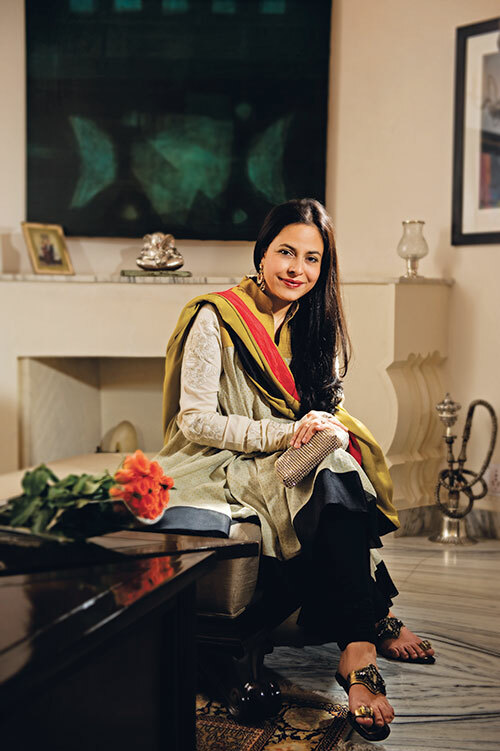 She sports a masters degree in law from the University of Pennsylvania, the position of legal junior counsel for the Ministry of Commerce, is ensconced on the board of directors of the NGO Khushii, is into seriously collecting art, boasts a knowledgeable wine cellar and is involved in giving back to society, discovering her mettle as a fine fund-raiser. And, did I mention that she has kick-started a cancer initiative, the Cancer Research Foundation, India (CRFI), after her mother was diagnosed with cancer and she discovered little help and support, not to mention awareness of the disease. Meet Tarana Sawhney, in her 30s, a mother of two and displaying evidence of her busy life in her beautifully furbished home. “I feel perfectly fine gushing about this house, it has such history, every single thing here has a history,” she says looking around. “It was built in 1954 and what sold it to me was the staircase. It reminded me of another time, of the film, The Thomas Crown Affair…. It fit into my sense of style which is basically classic. The story goes that the original person who built this staircase, went to Macarana, bought the marble, laid it out on the road outside and looked at it for days, matching it.” The living room is dominated, however subtly, by a fireplace which is “so old, we could not use it, but I have retained it after a lot of work.” And the paintings abound, covering the walls but testament only to the tip of the collection. 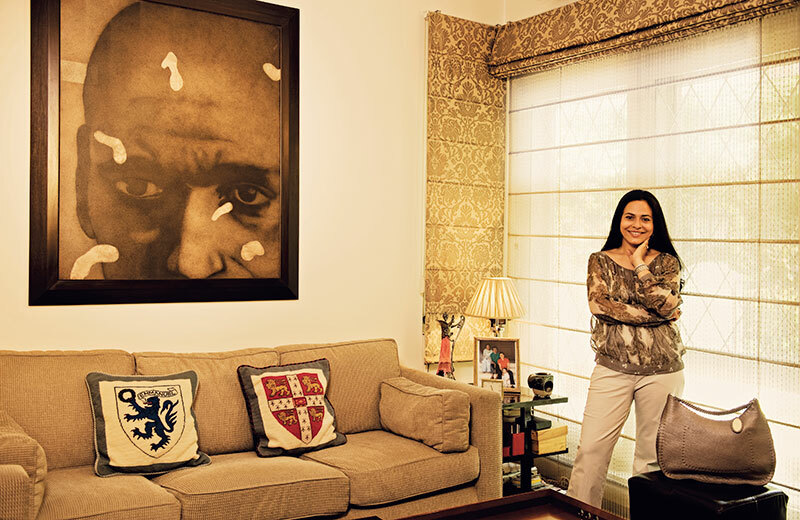 “My husband Tarun, who is related to the Gandhi family, and I are both very fond of collecting art. The Souza was the first painting he bought from his first salary.” Her heirloom ring sporting an uncut diamond and preserved for her daughter, flashes as she points to a vase on the table. “When we were first married and lived in London, we fell in love with Baccarat’s glass collection but could not afford to do anything but stare at it through the shop-window. We knew we would own it someday, though.” She has been taking her daughter to art exhibitions “since she was born”. And the two kids already have neatly-labelled paintings, 15-20 of them, bequeathed by their parents and kept safely in storage. A legacy of artwork bought for special occasions like birthdays, anniversaries, Diwali, with the occasion marked on each one. Bose Krishnamacharya, Chandra Bhattacharjee, Hema Upadhyay, Surendran Nair, T V Santosh, Thukral and Tagra, V S Gaitonde and an original Picasso print are some of the highlights of the collection. A colourful mid-sized painting that I notice on the living room wall is by French artist Marcel Mouly, the last surviving artist from the Picasso group. Sketches by M F Husain, Sakti Burman and Jogen Chowdhury, done casually for her, line the wall running up the marble staircase, sharing space with an ancient 300-year-old map, part of a collection including rare Tallis Maps, bequeathed by her mother-in-law. While Sawhney is not a jewellery person, she does love “fine old jewellery” like a favourite pair of antique earrings set with Golconda diamonds. She collects vintage bags, vintage pearls; loves ruffles and paisley. “I scrounged through my grandmother’s things and discovered several treasures,” she says, displaying a vintage bag in satin and georgette that she holds gingerly. Not surprising that one of her favourite possessions is a “very coveted string of real pearls that reach my ankles”. She is thrilled with a recent Fendi limited edition bag that is ‘so discreet’ with sterling silver fittings. She disdains loud accessories that shout the label, preferring understated chic. She believes in classic, eternal brands that “you do not own but rather keep for the next generation”. In the inner room, the cushions are embroidered with the Cambridge crest, her husband representing the third generation at this venerable institution. On the table, the glass coasters are irreverently decorated with images from their wedding album, family groups et al, a conversation piece and potential ice breaker at parties. In a wine cellar in a home in Simla and in wine cellars in London, are stored bottles of wine, collected slowly down the years by Tarun, a connoisseur and critic. And on the dining table is displayed a selection of breakfast pastries, newly warmed and accompanied by a collection of homemade jams, a repast redolent of Sunday brunches at home. She speaks now of good friend Aman Nath, patron like her of the NGO Khushii, advisor to the young art collectors and his great idea to get artists and celebrities to collaborate on canvas, the proceeds going towards Khushii’s projects in 97 villages in Rajasthan. “Khushii has been a very interesting journey for me,” she says, obviously inspired by the project. Sawhney, however, has learnt through her experiences that the model for NGOs needs to change from non-profit to a ‘profit for non-profit’ model since a lack of funds is mainly responsible for outreach programmes getting diluted. With this realisation firmly in mind, she is busy launching the World Action Forum which will identify 10 NGOs with a common mission and objective and work with them, making fund-raising a primary objective. “They will do the work for us and we will support them.” And while she ushers in this new phase of social responsibility, she ponders on investing in a larger house – big enough for all her collections and a heart that is large.